I teach online public relations at Tulane University, so I constantly keep watch for new books in the field. Along with my own mammoth how-to book, Complete Guide to Internet Publicity (now out of print) or the stiff but good British book, Online Public Relations, by David Phillips and Philip Young, I like to assign one book that is fresh, hip, current, and relevant. This year, I picked Content Rules even before reading it, because I love the title concept and I know one of the authors, Ann Handley, from when I used to write articles for ClickZ (back in the day, as they say). 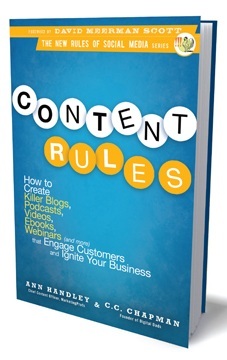 Content Rules is a relentlessly upbeat guide to developing content for the Internet. The authors not only stress that “content is king” online; it’s also queen, jack, ace, and most of the rest of the deck. Content Rules will show you how to find content in every corner of your organization, package it in every conceivable format, and syndicate it throughout the universe. Pretty impressive. “It’s not just about getting more traffic; it’s about getting more traffic that gives a s**t.” The authors quote social media consultant Jay Baer. That’s human enough for me. 1) Creating a content publishing schedule, especially the checklist for things to do each month on page 60. It’s a good template by itself for an online marketing game plan. 2) Six characteristics of a good case history, signature article, or customer success story (pages 72-73). Hiring someone trained as a print or broadcast journalist is a good option, because journalists are trained in how to tell a story using words, images, or audio, and they understand how to create content that draws an audience in. Their innate understanding of the audience also gives journalists a critical outsider’s perspective — a nuance that marketers can sometimes miss. They might be on your payroll, but they are better at expressing neutrality, which is a distinct advantage in creating marketing copy. 4) A terrific business-to-business (B2B) chapter with an emphasis on listening to and analyzing your target audiences and building customer personas. Contains a concise list of questions to ask about your customers on pages 125-126, along with a table used to analyze the results on page 128. The second section of the book is labelled “How-To,” but in one of the few weak spots, it starts off very badly with the Blogging chapter. How can you get through a blogging how-to without mentioning WordPress once? Or Blogger/Blogspot, for that matter? The advice on headlines, tagging, use of artwork, and other topics is threadbare. The advice on scheduling is wrong (posting “twice a week is optimal”), as is the advice to “Never edit any comment that is posted to your blog.” What about profanity filters, or formatting issues? But the authors immediately rescue the how-to section with a great chapter on Webinars. It’s full of details, software recommendations, examples, and sage advice. I love the tip, for example, that putting a video on the registration page for a seminar increases conversion five-fold. Most of the rest of the how-to section is good, especially areas where the authors shine: ebooks and case studies. Even the video chapter — the most complex and potentially expensive way to generate content — is well done. I really like HubSpot’s Rebecca Corliss‘ top 10 tips for producing a Web TV show (pages 203-205). At first, I was disappointed that the case studies were segregated from the text. However, the authors do not skimp on examples, case histories, and outside experts throughout the book. There are plenty of examples to go around. One benefit of segregating case histories is that it really drives home how companies use a variety of tools — blogs, newsletters, video, ebooks, white papers, apps, images, etc. — to get their messages out. This blended approach, with a unique blend for each company, would be lost if we saw only how they made their blogs, or only their video operation. The section gives a good gestalt. I started by saying that this book is almost perfect. The biggest oversight is the mainstream media. Almost all the content is aimed at consumers, yet many of the best results the campaigns pull are when they get picked up by the major media. Page 20 lists four objectives for an online marketing campaign. It needs a fifth: to engage in dialogue with the mainstream media in your field. How to attract and dazzle the media should be considered in all the content programs covered in the book. This omission is brought home in the very first case history, for the Reynolds Golf Academy. The owner uses video (and other tools) to reach his target audiences. But his first video was created by Golf magazine, which is where he got the idea (and 1.8 million views). And his biggest media hit was a write-up in The Wall Street Journal — again, over a million viewers. The major media still has major impact. For our clients, the most important result from a blog is not the loyal following it builds, but how that following gives the blog the voice of authority with the major media, leading to major media coverage, which supercharges results. So it’s important to take the mainstream media into account when designing your content. With that one exception, Content Rules is excellent. Hopefully, this book will convince many senior executives that online PR is about content, not traffic tricks or SEO gimmicks. Hopefully, readers will invest in a long-term strategy of accumulating a wide variety of compelling content rather than using stunts to briefly spike their numbers. I’m delighted to see how well the book is selling and how many positive reviews it has garnered. Congratulations to Ann Handley and C.C. Chapman on a significant contribution to the canon of online marketing. Image of the book cover is used under Fair Use: Reporting.